The nursing field has seen outstanding growth in recent years, and this should continue for the likely future. In reality, there actually is a nursing scarcity in many areas. This is being driven by the aging US population, who require more health care services as they move through their retirement years. The nursing shortage continues, and demand for nurses is expected to increase as the baby boomer generation ages and the nurses that are part of that generation retire. Nurses who specialize in various areas are often in even higher demand. The 20 specialties listed here were chosen based upon a combination of demand, salary, and settings. Over 100 different nursing areas exist, each of them with different demands, settings, and schedules. Nevertheless, the specialties listed in this article were chosen to cover a wide range of nursing interests. The Bureau of Labor Statistics states that nurses generally will see a 19% increase in demand by 2022. This demand could edge even higher for some specialties, the most popular of which are listed below. Note – we use average salaries from Indeed.com for each specialty, but your salary can vary depending upon where you work, education level and how much experience you have. A neonatal nurse works with premature babies, most often in an intensive care setting. They provide extensive care for premature infants who usually have a variety of health problems. Neonatal nurses must work closely and effectively with other health care professionals. You need to have at least a bachelor’s degree in nursing, and some have a master’s degree. You also need to have specialized training and/or experience in working with neonates. Job demand for this field should increase by 17% by 2022. The average salary is $65,000. A nurse midwife is a type of advanced practice registered nurse who provides and coordinates patient care for mothers and expecting mothers. These professionals do perform births, but they also work with mothers before, during and after delivery to ensure the health of mother and child. Most nurse-midwives have many years of experience as a nurse, and then they earn their Master of Science degree in nurse-midwifery. Job demand in this field should increase by 31% by 2022. The average salary is $79,000. A clinical nurse diagnose and treat patients who have more serious health problems in most cases. They usually work with these patients in a hospital in a clinical setting. Many of the patients are chronically ill, and suffer from heart and lung disease, cancer, or other chronic diseases that require specialized care. A clinical nurse also is an advanced practice registered nurse who has a BSN, and also a MSN. This professional also needs to have specialized, clinical nurse training. This field will grow by 20% by 2022. The average salary is $67,000. A critical care nurse works most often in the intensive care unit, or ICU. Many hospitals now have ICUs for specific health problems, including burns and heart/lung problems. A critical care nurse can work in any of these ICU departments. Critical care nurses may work in a hospital, nursing home or hospice. These types of nurses spend most of their shifts in the ICU carefully watching the health status os ICE patients. This field will grow by 16% by 2022. The average salary is $61,000. A dialysis nurse works with patients who have kidney problems and who must receive dialysis on a regular basis so that they can survive. When people have kidney problems, their kidneys are no longer able to filter the blood of waste products, which is then eliminated through urination. These patients need a dialysis machine to filter their blood for them. These nurses are experts with all kinds of dialysis, including hemodialysis and peritoneal dialysis. They also work with patients who recently had a kidney transplant. You must have a BSN, and should take classes in college that address dialysis specifically, such as nephrology and pharmacology. This field will grow by at least 19% by 2022. The average salary is $64,000. A nurse practitioner (NP) today is a very important part of most family medicine offices. These professionals work under the eye of a doctor, and they do patient exams, diagnose various illnesses and prescribe drugs. Some NPs are even able to have their own private practices in some states. NPs are becoming very much in demand, as there is a doctor shortage in the country. You must earn your BSN and MSN and pass the exam for licensure. You will need to have several years of experience in the field before you can get your license from the American Nurses Credentialing Center of the American Academy of Nurse Practitioners.. This field will see growth of at least 25% by 2022. The average salary is $94,000. A health policy nurse does not work with patients in a clinical setting. This type of nurse actually works at an administrative level in various public and private organizations to come up with policies that will make people in society healthier. A health policy nurse looks carefully at health care laws and devises strategies to change the attitudes of the public. This professional also helps to come up with more effective laws when necessary. You might work in a public health agency, a college or in a legislative body. You have to have your BSN and MSN degrees and have worked for some period of time in nursing. You then will need to get into this specialized field by participating in a health policy residency, where you will gain necessary health policy experience. Job growth in this field should be at least 17% by 2022. The average salary is $66,000. An informatics nurse collects, interprets and analyzes important medical data that comes into a health facility every day. An informatics nurse also often trains other nurses in the hospital on any new technology that is being introduced. Informatics nurses often work for hospitals, pharmaceutical companies and government agencies. The demand in this field is still growing, but the few nurses who have these specialized skills will find themselves in strong demand. You need to have your BSN and be a practicing RN. As you work as a nurse, you should take classes in informatics nursing, which may often be taking as continuing education credits. Job growth in this field is probably not as high as nursing overall, but the demand should steadily increase in coming years as health care facilities rely more and more on analysis of digital medical information. The average salary is $83,000. Nurse anesthetists belong to one of the most prestigious and well-paid fields in nursing. This field is in high demand and requires a high level of education, training and experience. Nurse anesthetists provide anesthesia to patients who are going into surgery. They also help manage patient care in the OR, and they provide follow up care for many procedures that are done on an outpatient basis. You need to have your BSN and obtain experience as a nurse for at least two years, then you should earn your MSN in nurse anesthesia. Then, you will need to work in acute care, such as an ICU or ER. You may in coming years be required to earn your Ph.D. in nursing as well, but these requirements continue to evolve. This field will grow by 22% by 2022. The average salary is $154,300. A nurse educator teaches other professionals to become nurses. You can work in many areas of nursing education. You might be an instructor at an associates’, bachelor’s or master’s degree program. 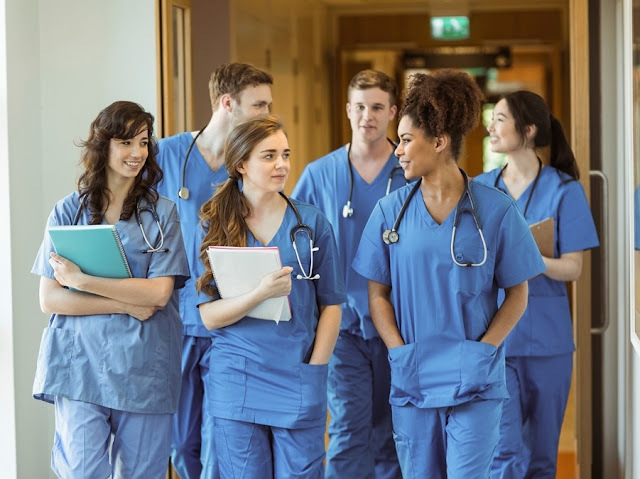 Given the high demand for nursing professionals of all kinds throughout the US, it makes sense that there also is great demand for nurse educators. You first need to be a registered RN and have at least a bachelor’s degree in nursing. You also may need to have your MSN. If you want to get some of the more prestigious teaching positions at a college, you may need your doctorate in nursing. This field should grow by 19% by 2022, which is much faster than average. The average salary for nurse educators is $65,000, but this can vary a lot depending upon if you work at a community college or a four year university.